Its been over half a year since moving in our new house, but we still have been wanting to find ways to turn the house into our own cozy home. The walls were very bare, so we decided that a fun way to bring color and personality to our walls is putting up some photos of our travels together. 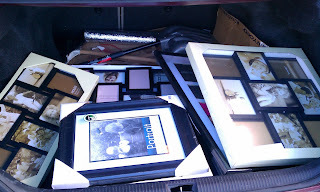 We decided to take advantage of the sales at both Michaels and ACMoore and got several frames for 40% off. Some of the frames required a bit of assembly. 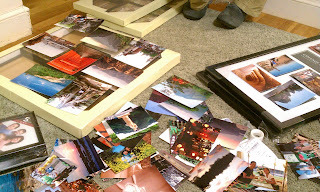 We had several photos printed out, so it was helpful to rearrange them in various combinations before actually putting them into the frames.